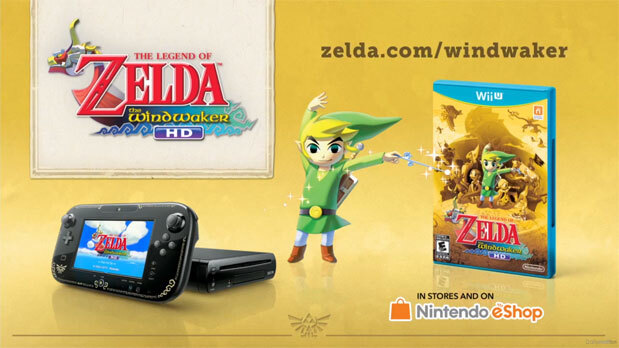 If you were waiting for the Legend of Zelda: Wind Waker HD to release before buying the Nintendo Wii U you're are in luck. A leaked promotional image of the bundle has been circulating online since yesterday (image above). The design seems similar to The Legend of Zelda: Ocarina of time limited edition of the Nintendo 3DS with a Wind Waker flare. - Hero Mode will be available form the start and can be switched on and off as you please. (Hero Mode was first introduced in the Legend of Zelda: Skyward Sword, but was only obtainable after you have beaten the game.) Hero mode makes the game harder, for example enemies will dear more damage. - If you remember back to when you go to obtain the Master Sword, Hyrule use to be in black & white but now it area carries a Sepia tone. There is currently no exact release date for The legend of Zelda: Wind Waker HD or the bundle but you can look forward to both of them come October.